Stallone confessed that during the production of Rocky V, he was “negligent”. Rocky Balboa is very much a companion piece to Rocky only. There is little mention of the sequels, with no footage whatsoever from Rocky V. It is a real shame that the history of Rocky since Rocky II is ignored. I wouldn’t expect a constant reference to all the previous instalment’s, but the previous films were made and they are part of a chronological story that should be respected. Rocky Balboa is the only film that does not begin with a boxing match, indeed it is the only Rocky-film that does not pick up after where the other film left off. This lack of connection to the previous instalment’s does jar a little when you have watched the previous four films. Rocky Balboa, no matter how strong it may be, feels much more of an epilogue to the series rather than a closing chapter. The “Story of Rocky” seems to progress very naturally until Rocky V, but Rocky Balboa takes huge liberties in the gap between the previous film in 1990 that they could almost attach Rocky Balboa to the end of Rocky V with the subtitle “15 years later…” and leave it as an over-3-hours cut of the final chapter. One reason that I refused to watch the sequels for a long time was an assumption on my part that I “knew” when Adrian died. I knew that she would die at some point in the franchise … but I don’t know where I got that idea from because she dies outside the franchise between the two films. This set-up, takes Rocky and Paulie to a very dark place. The film begins with Rocky visiting her grave side on the anniversary of her death. Personally, this magnifies how much of a separate film this is to the previous instalment’s. Rather than opening on panning-shots of Philadelphia, it would’ve been nice to open the film using different shots and images to fill in the gap – a picture of Rocky in the newspaper post-Rocky V, the graduation of his son, the awareness of Adrian’s illness, Rocky by her bedside. Think the first 15 minutes of Up and pull it down to five-minutes setting up Rocky’s current status. It would simply connect everything together. Having said that, without casting Talia Shire in the film, her presence is littered throughout. Stallone is a broken man – he doesn’t fight, he is estranged from his son and he owns a restaurant … called “Adrian’s”. At this point we are introduced to Marie (Geraldine Hughes) – the tomboy from Rocky. The idea that, as Rocky was living his life, the world kept spinning and some people never left the neighbourhood is poignant. Spider Rico, equally, never left the neighbourhood. Crucially, Marie is not a love interest, but her role does ensure that a female sensibility is adhered to. Rocky, when discussing his decisions and the choices he has to make needs someone to talk to now Adrian is gone – and Marie is that person. But the theme of children today is two-fold. On the one hand we see the apathetic and disillusioned Rocky Jr, whilst Mason Dixon and his success seems much more modern and the credibility is what Dixon seeks: the money is not all there is to it. Money was what Tommy Gunn was desperate for – credability didn’t matter to him – he fought Rocky in the streets! In addition to this parallel to Rocky V, we also see more agents desperate to use Mason Dixon – and Rocky – as a way to earn huge sums of money. Much like George Washington Duke’s role in Rocky V, but without the comeuppance. Technically, Stallone employs textured shots. There is no ‘sheen’ to the screen when we see him on the streets of Philadelphia. The sharpness and dry surface complements the rough area Rocky now lives within, but suffice to say, this separates the film further from the previous films. Contrary to all the flaws I found in the film, I can appreciate the closure we gained. As mentioned, Rocky V did seem to drop the ball – especially with the final fight on the streets. 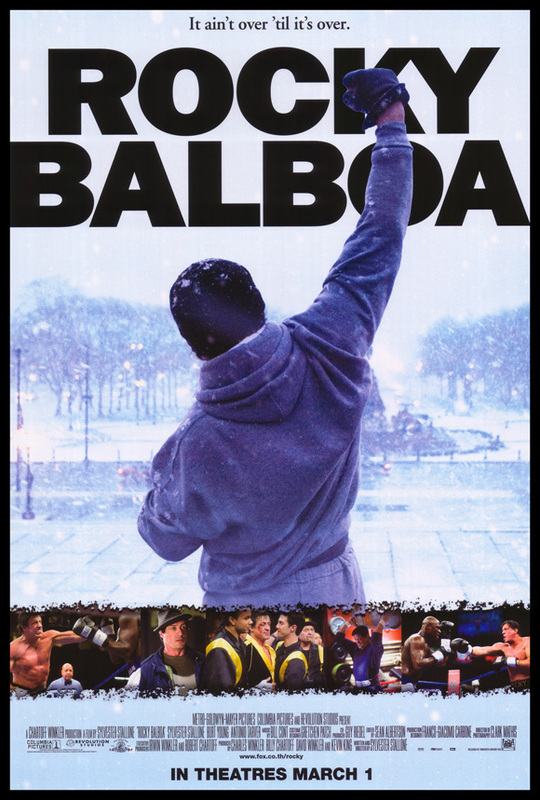 Rocky Balboa manages to give us a huge fight, in the ring, with a finale the wholly represents the message of Rocky. It’s not all about winning – it’s about challenging yourself. This manages to show an emotional depth that Rocky V lacked, but I think the final two films could’ve simply been played differently. The themes and ideas in Rocky Balboa are great, but the film simply lacks consistency with the rest of the franchise. You could almost ignore every sequel and just put Rocky and Rocky Balboa as a duo. This, I believe, is a real shame because the sequels do have so much to offer. This is the only one I haven't seen. So I'll read when I have catched up on it. I do recommend listening in on the Now Playing Podcast Rocky retrospect. Their podcasts are awesome when one have screened the films recently. Thanks for posting these articles about the Rocky films. I've really enjoyed reading them and you've given some interesting insights and ideas to ponder. As for Rocky Balboa, though I do think it works really well as a double-feature with the first film, I don't think it completely neglects the other films. Rocky himself in the film is clearly very famous, much more so if he had just had the one fight with Apollo. I think it references the first a lot because Rocky is back living in his old neighbourhood, being constantly reminded of where he came from and where he is now, and struggling with that. I don't think Rocky Balboa is flawless, and it ranks fourth for me behind I, II and III, but honestly I wanted more by the end. I want a longer cut. And that is a fine compliment to give to the sixth film in a franchise. @Rhys – I guess, if it was longer, they could deal with more issues and gain closure to everything. I do like the film – I think it simply seemed a little to detached from its predescessors.